The feathery dresses explore touch memory based on the idea of intimacy maps on the body. There are three touch sensors (soft, conductive textile switches) that record touch events on the body. 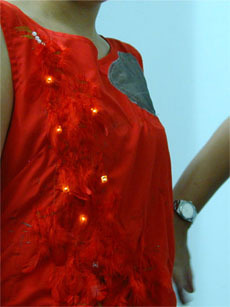 These events are the inputs into the simple program running on a microcontroller, and the touch history is displayed through a pattern of illuminated feathers embroidered on the dress. The use of a microcontroller allows us to use much less conductive material in the body of the dresses and reduces failure rates due to broken connection.